Economic historians have made great progress in unraveling the causes of the Great Depression, but not until Scott Sumner came along has anyone explained the multitude of twists and turns the economy took. 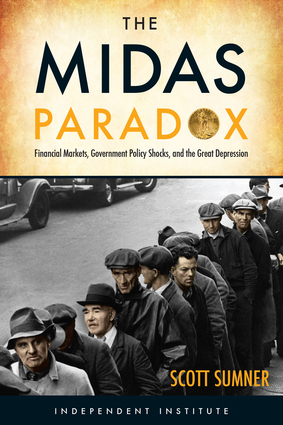 In The Midas Paradox: Financial Markets, Government Policy Shocks, and the Great Depression, Sumner offers his magnum opus—the first book to comprehensively explain both monetary and non-monetary causes of that cataclysm. Drawing on financial market data and contemporaneous news stories, Sumner shows that the Great Depression is ultimately a story of incredibly bad policymaking—by central bankers, legislators, and two presidents—especially mistakes related to monetary policy and wage rates. He also shows that macroeconomic thought has long been captive to a false narrative that continues to misguide policymakers in their quixotic quest to promote robust and sustainable economic growth. The Midas Paradox is a landmark treatise that solves mysteries that have long perplexed economic historians, and corrects misconceptions about the true causes, consequences, and cures of macroeconomic instability. Like Milton Friedman and Anna J. Schwartz's A Monetary History of the United States, 1867–1960, it is one of those rare books destined to shape all future research on the subject. Scott Sumner is Research Fellow at the Independent Institute, Professor of Economics at Bentley University, and Director of the Program on Monetary Policy at the Mercatus Center. He edits the influential blog, The Money Illusion. In 2012, the Chronicle of Higher Education referred to Sumner as "among the most influential" economist bloggers, along with N. Gregory Mankiw of Harvard University and Paul Krugman of Princeton University. In 2012, Foreign Policy ranked Sumner jointly with Federal Reserve Chairman Ben Bernanke 15th on its list of "100 Top Global Thinkers." He received his Ph.D. in economics from the University of Chicago. Professor Sumner is a contributor to numerous scholarly volumes, and his articles and reviews have appeared in such journals as the Journal of Political Economy; Business and Society Review; Journal of Policy Modeling; Economic Inquiry; Contributions to Macroeconomics; Economic Letters; Journal of Macroeconomics; Journal of Money, Credit and Banking; and Bulletin of Economic Research.